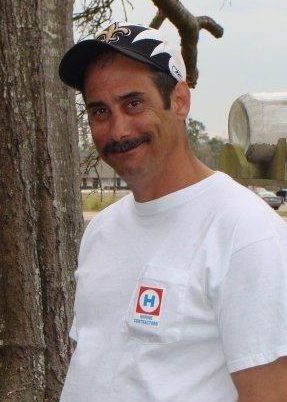 David “Coonie” Arabie, 53, of Lafayette, Louisiana, passed away Saturday, March 30, 2019, at his home in Lafayette, surrounded by his family. He was born on August 16, 1965, in Port Arthur, to Jeanette and Nolton Arabie. Coonie worked offshore as a crane operator for over twenty years. On his days off he enjoyed spending time with his family. He enjoyed hunting with his son and grandson whenever he got the chance. Coonie’s love for LSU Tigers was a trademark he wore with pride. You would rarely see him not dressed in purple and gold. Survivors include his wife, Misty Hatcher Arabie of Lafayette, Louisiana; son, Dustin Arabie and his wife, Mandy, of Pine Prairie, Louisiana; daughter, Marissa Arabie of Lafayette, Louisiana; grandchildren, Sylus and Hannah Arabie of Pine Prairie, Louisiana; and brothers, Ronald Arabie and his wife, Lisa and John Arabie and his wife, Sarah Tharp, all of Honey Island. He is preceded in death by his parents; brother, Nolton Arabie, Jr.; sister, Katherine Elaine Cooley; grandparents, Rena and Lawrence Arabie and Mildred and Everett Day. A gathering of Coonie’s family and friends will be 4:00 p.m. until 8:00 p.m., Tuesday, April 2, 2019, at Broussard’s, 530 West Monroe, Kountze. His funeral service will be 11:00 a.m., Wednesday, April 3, 2019, at Broussard’s, with his interment to follow at Jordan Cemetery, Honey Island. My sympathy and prayers to Misty and family. May God's peace fill your void and comfort you. So so sorry! Praying for you all!! I attended the crawfish boil at Broikshires and saw David there. He was true grace under fire and displayed a courage most would envy. Prayers for his family during this difficult time. David arrived on a Monday. He oassed on a Saturday. Rest in peace. Our deepest condolences to all the family. May He truly rest in peace. David will be missed. But I know that he is reunited with his mom and dad in Heaven. Rest In Peace David.